Andrew Gwynne, MP for Denton and Reddish, is calling for the Care Bill legislation to be changed to ensure the NHS in England identifies and signposts cancer carers to support. In an event in Parliament, Macmillan Cancer Support briefed MPs on the urgent need to improve the lives of people selflessly providing unpaid care to loved ones with cancer, as well as Macmillan’s work to ensure that no one faces cancer alone. In his meeting with Macmillan, Mr Gwynne discussed the needs of the 905,000 people providing unpaid support for loved ones with cancer in England. Half of these cancer carers are not receiving any help despite it having a substantial impact on their lives. Cancer carers come into contact with health professionals far more often than they do with their local authority. However, the NHS is not identifying and signposting enough of them to support. This means that as few as 5% receive a carers assessment. The Care Bill places a welcome duty on local authorities to identify carers. However this duty does not cover health bodies meaning cancer carers will continue to slip through the net. This is why Andrew Gwynne is joining Macmillan in calling for the Care Bill to place a shared responsibility on both the NHS and councils to identify carers. 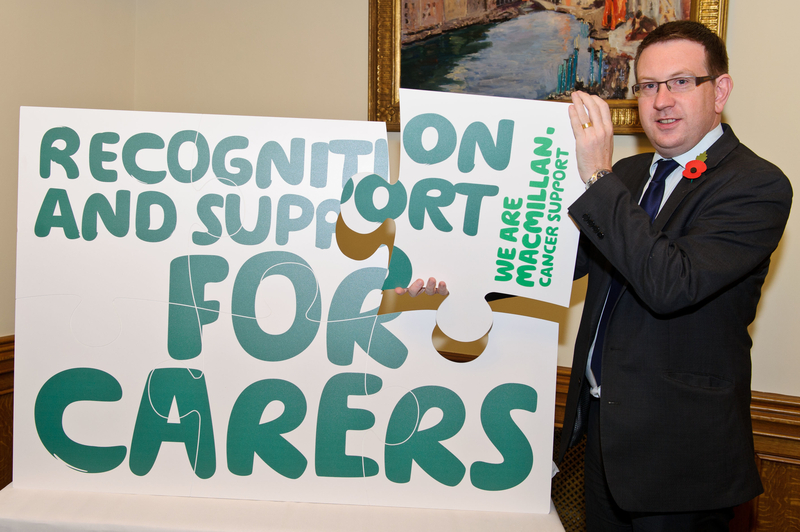 By attending the parliamentary event, Andrew Gwynne MP is continuing to work with Macmillan in Tameside and Stockport and nationally to ensure that people affected by cancer and their carers are helped and supported throughout their journey. Andrew Gwynne is pictured with a piece of a jigsaw puzzle representing the integral part carers play in the care of cancer patients. Similarly, the responsibility for the NHS to identify carers is a vital piece missing from the Care Bill. By supporting the campaign, Mr Gwynne is helping to put cancer carers back in the picture. “The Care Bill represents a crucial opportunity to improve the provision of support for cancer carers and we must capitalise on this chance before it is too late. By identifying cancer carers and letting them know what information and support is available, doctors, nurses and other health and social care professionals can have a positive effect on their quality of life, and improve their ability to carry on caring for their loved one.